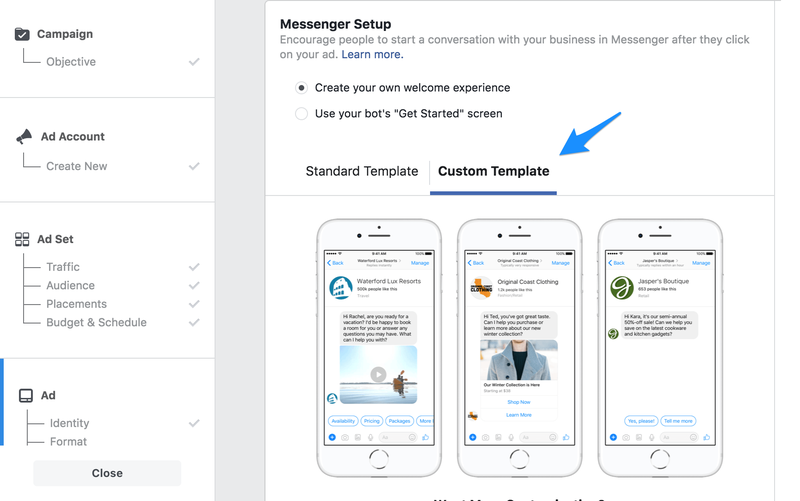 As an alternative to delivering coupons on a landing page, you can set up a Facebook Ad that automatically opens a Messenger conversation with your customer. An automated bot sequence then delivers a single-use coupon code to the customer inside the conversation, followed by a link to your Amazon listing. Click-to-Messenger Ads, also known as JSON Ads, are a very low-friction way to distribute coupon codes, and can be great for product launches or high-velocity campaigns targeted at ranking for keywords. To begin, click “New Campaign”, and select “Click-to-Messenger Ad”. The final step under Integrations is to add a Redirect URL. This is the link your customer will go to when they click “Go To Amazon”. This is commonly used to add a URL that helps you rank for keywords, such as a 2-Step Storefront URL or Super URL. If you leave this feature off, the call-to-action will go straight to the regular product listing URL. Upload your single-use promo codes at the final step, and hit “Save” when done. Click “View Publishing Options” to reveal the JSON code you will need to connect the sequence to your Facebook ad. Set up the creative elements of your ad as you wish (be sure to be clear about your product and the offer presented). This is all you need to set up a coupon distribution JSON Ad. You will be able to track the number of promos claimed on your Dashboard, however be aware that we are unable to give stats on campaign views (and therefore conversion rate). To calculate your campaign's conversion rate, use the statistics from within Facebook Ads manager, combined with the number of coupon claims.